Most vehicles run on fossil fuels, and this presents a major emissions problem as demand for fuel continues to increase. 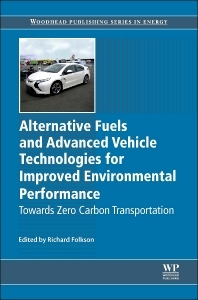 Alternative Fuels and Advanced Vehicle Technologies gives an overview of key developments in advanced fuels and vehicle technologies to improve the energy efficiency and environmental impact of the automotive sector. Part I considers the role of alternative fuels such as electricity, alcohol, and hydrogen fuel cells, as well as advanced additives and oils, in environmentally sustainable transport. Part II explores methods of revising engine and vehicle design to improve environmental performance and fuel economy. It contains chapters on improvements in design, aerodynamics, combustion, and transmission. Finally, Part III outlines developments in electric and hybrid vehicle technologies, and provides an overview of the benefits and limitations of these vehicles in terms of their environmental impact, safety, cost, and design practicalities. Richard Folkson is Royal Academy of Engineering Visiting Professor for Innovation and Design and Deputy President of the Institution of Mechanical Engineers.